We’ve been hearing a LOT of noise from Donald Trump about Republicans’ plans on health care… but not much when it comes to specifics. We can’t stress this enough: Donald Trump and Republicans have absolutely no health care plan, despite their ongoing pursuit to destroy the ACA. Their record shows they’re more concerned with taking away health care than making sure Americans have it. Trump and Republicans are trying everything they can to obscure their terrible record on health care to voters and the media. When it comes to health care, the contrast between Republicans and Democrats couldn’t be clearer. Over the past two years, the Trump administration has been obsessed with trying to sabotage the Affordable Care Act however possible: Through the courts, shady regulations, and shoddy implementation. And don’t get us started on congressional Republicans, whose health care plans like the Graham-Cassidy bill would’ve eliminated insurance coverage for upwards of 21 million people. Meanwhile, Democrats across the country are more committed than ever to ensuring every American can access the quality, affordable health care they deserve. Already this year, Democrats in Congress have introduced provisions to protect people living with pre-existing conditions, lower health care costs, and stop the Trump administration’s damage to the Affordable Care Act. If you’re ready to elect Democrats in all 50 states, make a contribution today. This organization is powered by you, and we’d love to hear your ideas. Just reply to this email to send any comments, criticisms, or feedback. Our community management team reads every message from supporters like you. Thanks for supporting our party! Contributions or gifts to the Democratic National Committee are not tax deductible. Paid for by the Democratic National Committee, www.Democrats.org, and not authorized by any candidate or candidate’s committee. Quick survey: What matters most to you? Please take this two-minute survey to share your priorities and say why you’re in this fight. On a typical presidential campaign, the candidate spends a lot of time listening to wealthy donors and hearing what issues they care about. Not on this campaign. No one can buy access to Elizabeth. And she wants to hear what everyone on our team thinks. Every single supporter owns an equal piece of our movement. Everyone’s voice matters. Our campaign is about the priorities of the people — not the wealthy and well-connected, and not the powerful special interests. So what should we focus on? Fill out this two-minute survey to share what issues are most important to you. Thank you for your support over the last two months. In that short amount of time, this community met the 65,000-donor threshold to get invited to the DNC debate, raised more than $7,000,000 in the first quarter, and introduced us to voters all across the country. I’m making an announcement in South Bend on April 14th and would be honored if you would join me. Whether you’ll be supporting us from home through our livestream or joining us in person, we want you to be a part of the special day. My grandma came to America when she was just seven years old after being separated from her dying mother. I watched the pain of never getting to say goodbye haunt her even as a seventy-year-old woman. I see her image in the children at our borders today — children as young as infants ripped from their parents, locked in cages, and even “lost” in the system. Today is Equal Pay Day — a day to acknowledge that on average, a woman had to work all of 2018 and this far into 2019 to earn what a man earned in 2018. American women earn 20% less than men. On average, Black women are paid 61 cents, and Latinas 53 cents, for every dollar a white man earns. On top of that, women who choose to have a child lose 30% of their earnings permanently. To all the women not being paid fairly, or who even have to wonder if they’re being paid fairly: I believe you deserve better. There are many things we need to do to make sure women have the same freedoms that men do. I‘d like to propose a new law mandating gender pay transparency. For every large company, the US should publicly disclose a simple annual gender pay gap score: for every dollar the company paid to men, how much less did it pay to women? 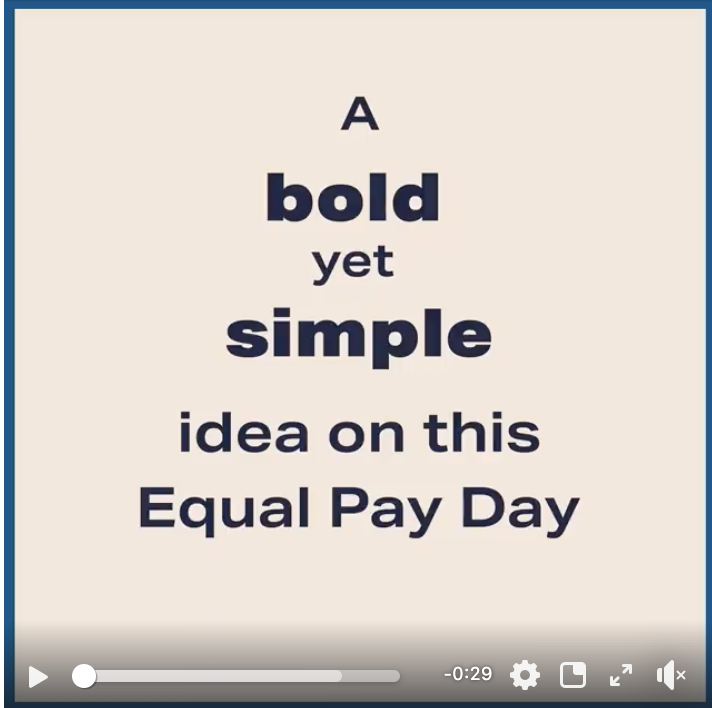 April 2 marks Equal Pay Day — the number of days that an average woman must work into the next year to earn the same as her average male counterpart. The impacts from wage inequity aren’t abstract… they affect child hunger, crime rates and countless other factors we know that are directly related to the economic independence of women. The events of recent months have reminded us that every single person should both feel and be safe when engaging with the California Democratic Party (CDP). That has not always been the case, but it must be if we are to both live out our democratic values and move California forward. Implement a system change that acknowledges the pain and suffering experienced by the victims of misconduct and harassment and ensures that it never happens again. We cannot wait. We must act now. So, I’m starting today. Thank You + Town Hall! Thank you for your incredible support! Our Moneybomb was immensely successful, as we raised over $260k from thousands of donors in the last weekend. For the quarter, we raised over $1.7 million from 80,000+ donors. What’s most exciting to me is that 99% of these donations were in amounts under $200, with an average of only $17.92. 95% of donations came in after February 11th so we raised this money in essentially the second half of the quarter. We are showing this country that someone supported by normal Americans can compete at the highest levels. Thank you so much for believing in this campaign. Without you, none of the great news I’m about to share would be possible. We just received the news – I am getting a CNN Town Hall on Sunday, April 14th at 8pm EST! This is an enormous opportunity for me and the campaign. Most Americans are just getting to know the various candidates. Together we can make the case to the American people for a new economy that works for people. More info to come about how we will rally the Yang Gang around our national moment. One way for people to get to know us is to get out and talk to people —I am thrilled to announce new dates for the Humanity First Tour. We are heading to New Hampshire this weekend, followed by Boston, DC, Atlanta, LA, Vegas and back to Iowa this April. See here for more dates and check out the image below. We had 3,000 people in San Francisco and 1,000 in Chicago, so we have been booking bigger venues. We would love to see you there—let’s build a movement that reshapes our country. My grandmother immigrated here from Mexico when she was seven years old. One of my strongest memories is my grandmother telling me about coming to this country as a child after being separated from her dying mother. Even as a seventy-year-old woman, when she recounted those moments, she would cry like the seven-year-old girl she was when it happened, sobbing that she never got to say goodbye. I see her image in the children at our borders today. As a candidate for President of the United States, her memory guides how I think about many issues — most notably, our immigration policy. Protecting our borders and treating immigrants with compassion are not mutually exclusive. It’s time we recognize the most important part of our immigration system—people. That’s why this morning I unveiled my People First Immigration Policy to reflect the collective values that we all share — equality, fairness, justice, and compassion. A new recent study shows that rising sea levels are a bigger threat to California’s economy than any of the worst natural disasters in our state’s history. In California, we can’t afford not to address climate change — and so we’re continuing to take aggressive action to protect our state’s people and resources. We recently demanded the Environmental Protection Agency drop an attempt to weaken greenhouse gas emission standards for coal plants and supported a lawsuit led by Oakland and San Francisco to hold fossil fuel companies accountable for the costs of climate change. Can I count on you to help me keep fighting for action on climate change? Chip in $5 now. Recent wildfires in California have devastated countless families and cost billions in state and federal suppression costs and insurance claims. Climate scientists and fire experts are predicting more of the same in the coming years. On Earth Day, April 22, 2019, two outstanding speakers from the fields of climate and economic policy will be in Fresno discussing the links between climate, California fire risk reduction and protecting our local health and economy. The date coincides with the 49th annual Earth Day, started by a Democratic Senator and a Republican Congressman in 1970 to mobilize public awareness of air, water and soil pollution. This free, non-partisan lecture presents the peer-reviewed science and economics related to climate change and wildfires. It will also provide information about the ground-breaking bipartisan legislation recently introduced in Congress known as the Energy Innovation and Carbon Dividend Act (HR763). Republicans are once again gearing up to take away health care from millions of Americans. Just this week, Trump called for the GOP to cruelly repeal Obamacare. That’s on top of his Justice Department refusing to defend any portion of the Affordable Care Act in court. It’s unacceptable. The American people have shown, time and again, that we support Obamacare and health care for all — including in our historic Blue Wave last fall. But apparently, Trump and the GOP haven’t learned (or they don’t care). So it’s up to us to defeat them even more resoundingly in 2020. Before our end-of-quarter deadline at midnight tomorrow, will you chip in $20.20 right now as we build towards Democratic victories next fall? This week, we stood in witness to the incredible bravery of Kate Earley. Her courage to speak her truth in the face of immense scrutiny and willingness to walk away from her legal case and forgo her day in court should inspire all of us expected to lead. Kate knew the costs of her actions and spoke her truth anyway. And yet, this week, so many leaders in our Party have remained silent – me included. One of the most important values Emerge California instills in each program participant is to never let another woman stand alone. It’s not every day that your wife announces that she’s running for President of the United States. But on that snowy February day in Minneapolis at Boom Island Park with the temperature hovering around 16 degrees, Amy did just that.